This morning, Capcom officially announced Lost Planet 2 for the Xbox 360 with a very carefully worded press release. There were the words "Xbox 360" and the term "exclusive," but not the phrase "Xbox 360 exclusive." Capcom simply stated the game was "being developed for the Xbox 360." Yet, the company was reluctant to state it was an exclusive. 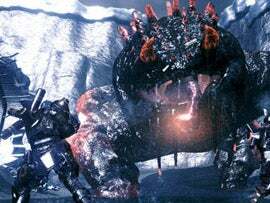 When website Edge Online asked whether Lost Planet 2 was indeed an exclusive, a Capcom spokesperson replied, "All we can say at this time is that we've announced Lost Planet 2 for the 360. That's all I can say." Last fall, Capcom swore off exclusives, stating "All major titles launched during the next fiscal year or thereafter will be developed as multi-platform games." Lost Planet 2 is a major title. Just sayin'.